Published in the South Kent Gazette, 9 April, 1980. During the 18th century Dover mariners played a big part in improving the cross-Channel packet service. They improved their ships and vessels launched from Dover shipyards or Shakespeare Beach gained the reputation of being the swiftest sailing vessels in England if not the whole of Europe. During the final century of the sailing packets there was practically nothing to beat them. They -were the envy not only of foreign shipyards but our own, and orders flooded in. In the early part of the 19th century the sailing packets operating the cross-Channel service were sloops of 60 to 70 tons which did the Calais trip in three hours and Ostend in seven hours. A fine model of one of these ships, the King George, built in 1814, is in Dover Museum. Her sister ships were the Chichester and Lord Duncan. First steamer to cross the Channel was the Majestic, with 200 passengers, in 1816, while the first to operate a regular steam packet service was the paddle steamer Rob Roy. Built by William Denny, of Dumbarton, in 1817, with 30hp Napier engines, she came to Dover in 1820 and operated the service for about a year before the French bought her to operate the mail service. At home the Post Office reacted by acquiring the 83ft packet Spitfire with 40hp engines. To acquire the land upon which they built their terminus, the Railway Company obtained a special Act of Parliament. They had mainly to reckon with the Dover Harbour Commissioners, who, under the charter of James I, were the ground landlords of the whole of the area from the South Pier up to Archcliffe. The terms for that were arranged by mutual agreement, the Railway Company paying the Harbour Commissioners £23,500. On the land in addition to various private properties, which had to be settled for with the various owners and lessees, there were the pilots’ look-out and the Townsend Battery. The latter being an obsolete earthwork, it was disestablished without special consideration; but for the pilots’ lookout, which then stood on the site of the Lord Warden Hotel, there had to be a substitute. A substantial pilots’ tower was built at the south-eastern angle of the station, through the basement of which the trains ran on to the Admiralty Pier. This tower was demolished in 1913, when the Marine Station was built on the widened Admiralty Pier, the pilots’ headquarters being moved to the Esplanade. 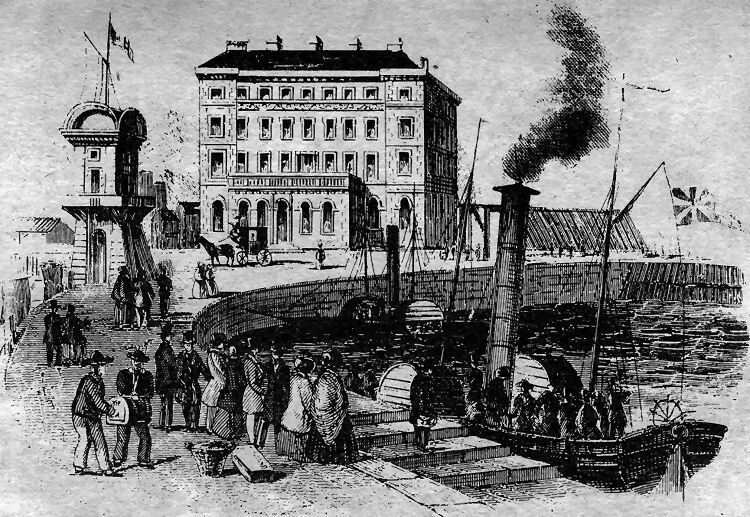 In disposing of that large piece of their sea frontage, the Harbour Commissioners made the transfer subject to the land being used only for the purposes of the railway. A little later, the company asked the Harbour Board to sell them two freehold sites for the erection of hotels, a request which was refused. The company, being opposed in that direction, determined to utilise a part of the site already purchased for the station, whereon they erected the Lord Warden Hotel. Soon after the purchase of the site, which took place in April, 1843, tenders were invited for the erection of the passenger station and the goods shed. In December of the same year, thirteen tenders were received (none, apparently, from local builders), the highest tender being £34,940, and the lower £29,475. The latter was from Mr Grimsdell, which was accepted on the condition that the work should be finished by the 12th of April, 1844. The railway was opened to Dover, by using a temporary station, on the 6th of February, 1844; but when the permanent station was actually completed does not seem to have been recorded. The plans, as drawn by the engineer Mr Cubitt, provided a building of considerable architectural pretensions, it being intended to ornament the structure with a tower, to contain a clock and a bell; but the actual buildings lacked the ornamental features promised by the plans. The use of the town station by passengers ceased during the war 1914-18. Beach Street changed but little from the time the South-Eastern Railway came to Dover until 1913-16, when the old houses oh the landward side were demolished and the new Corporation houses, demolished in the 1970s, were erected. Between Beach Street and the site of the old Paradise Pent were a group of short streets and lanes. Some are now only memories. All these—Round Tower Street, Council House Street, Middle Row, Seven Star Street and Clarence Place, as well as Beach Street (already noticed) —at first consisted of shingle banks, which accumulated outside the wall that Sir John Clark built on the southern side of Paradise Pent, retained by the groynes, which were thrown out to catch the shingle in its rear. This attractive old print depicts the Lord Warden Hotel and the pilot tower before the line to Folkestone was cut through Its base to the station platform on the Admiralty Pier. If the artist’s drawing is accurate it would appear that there was then no protection from the weather or heavy seas breaking over the pier for passengers waiting to board the little paddle steamer operating across the Channel. The picture above is from the same series of engravings, which were published in booklet form but not dated. It shows one of the first boat trains of the old London, Chatham and Dover Railway heading for the Admiralty Pier.